This young Parisian really is at the centre of the current French electro revolution. Noob worked alongside close friend Brodinski earlier this year to release Peanuts Club. Arguably the hottest track of the summer with heavyweight DJs Erol Alkan, Tiga and A-Trak. The B-side track Cajou Club is another absolute bomb, maybe even bigger than Peanuts Club, and more evidence that France has produced yet another two major players in dance music. Noobs really been hitting his stride lately with terrific remixes of Brodinskis, Oblivion, Tigas summer smash hit Shoes and also the massive Lyposuct by D.I.M. & Tai out on Boys Noize Records. Noob is consistently releasing great records and its not hard to see why hes been described as One of Turbos rising stars of the year by Turbo Recordings label owner Thomas Von Party. 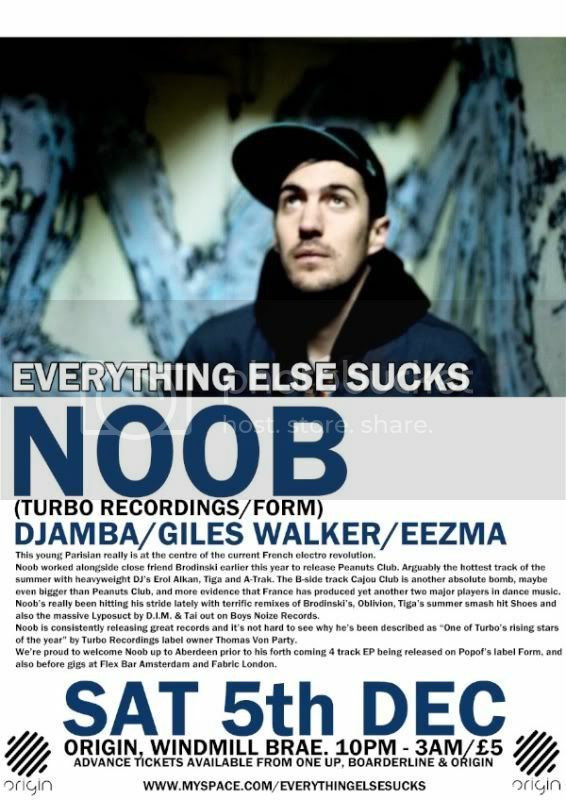 Were proud to welcome Noob up to Aberdeen prior to his forth coming 4 track EP being released on Popofs label Form, and also before gigs at Flex Bar Amsterdam and Fabric London. After a great weekend of Brodinski madness, catch his partner in crime Noob at Origin on Saturday. I'll be there photographing this fine evening, so every where your best face! Noob's coming hot off his tour in Mexico to the bright lights of.... Aberdeen.